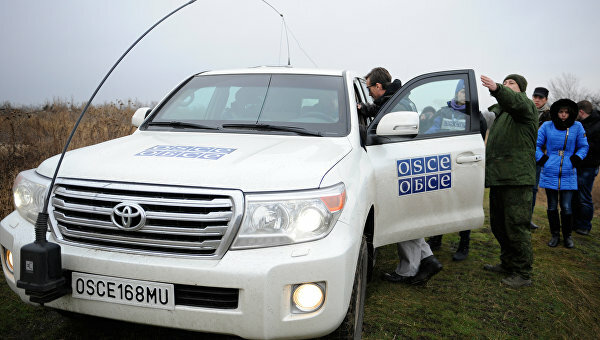 OSCE Mission does not register the Ukrainian Army weaponry banned by Minsk Agreements, Donetsk People’s Republic (DPR) Deputy Defense Minister Eduard Basurin claimed on Saturday, March 5th, RIA Novosti news agency informs. Joint Centre for Ceasefire Control and Coordination is a group to monitor the compliance with the Minsk Agreements. It consists of representatives of Russian Federation, Ukraine, Donetsk and Lugansk People’s Republics. At the end of January 2016, it became known that the Ukrainian side withdrew its military staff present in the DPR territory from the Commission. In February 2016, the Ukrainian side initiated a number of criminal proceedings against the Russian officers, who are the members of Joint Centre for Ceasefire Control and Coordination. A Russian general belonging to the Joint Centre for Ceasefire Control and Coordination was shelled by Ukrainian militants on March 5. This entry was posted in News from Ukraine and tagged DPR, JCCC, OSCE, Ukraine. Bookmark the permalink.